FORT MILL, S.C. – April 15, 2019. 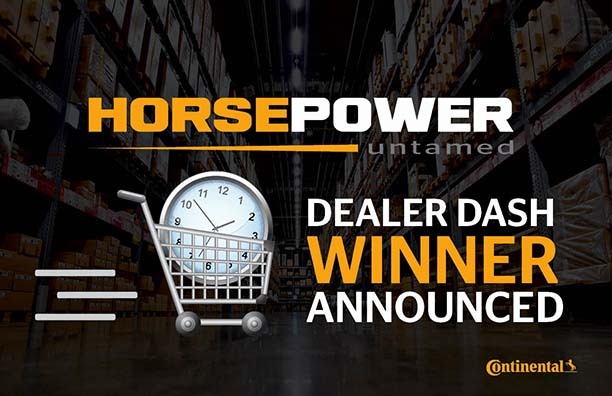 Continental has selected the winner for its inaugural Untamed Dealer Dash, recognizing participants in the company’s Horsepower dealer rewards program. The winner, chosen in a random drawing, is Wayne Winders, an outside sales representative at Industrial Tire Service. Winders will receive a trip for two to New York City in June, where he and his wife Ashley will run like “wild horses” through Continental’s gift warehouse, keeping everything they can grab in 60 seconds. Typical items grabbed from the warehouse include flat screen TVs, electronics, hunting and fishing equipment, and home appliances. Winners take home an average of around $10,000 worth of products in the 60-second dash, according to the event coordinator. More than 300 salespeople from 69 different dealers qualified for the Untamed Dealer Dash drawing. The Horsepower program rewards salespeople working for Continental tire dealers in the U.S. and Canada, based on the number of Continental and General Tire commercial truck and bus tires and ContiPressureCheck digital tire monitoring solutions the employee sells during the year. Salespeople can qualify for three award levels, which grant them increasing rewards and benefits, including entries into the random drawing to select the Untamed Dealer Dash winner. Silver level participants receive one entry, Gold participants receive two entries, and Platinum participants receive three entries into the drawing. The winner, Wayne Winders, reached Platinum level in 2018, selling 4,300 tires. When asked why he sells Continental tires, Winders replied, “They are a premium quality tire that Continental stands behind.” He sells to all types of customers, including industrial, off-road, line haul, regional truck, and school bus. Continental’s wide portfolio of tires and retreads, as well as sales programs, make it possible to fit the needs of many customers and applications. Dealer salespeople interested in participating in the 2019 Horsepower program should speak to their local Continental representative. The drawing for the next Untamed Dealer Dash will be held in March 2020. Entries are based on 2019 full year sales submitted to the Horsepower portal.